The anterior cruciate ligament (ACL) is one of the most commonly injured ligaments of the knee. The incidence of ACL injury is higher in people who participate in high-risk sports such as basketball, football, skiing, and soccer. he bone structure of the knee joint is formed by the femur, the tibia, and the patella. The ACL is one of the four main ligaments within the knee that connect the femur to the tibia. The knee is essentially a hinged joint that is held together by the medial collateral (MCL), lateral collateral (LCL), anterior cruciate (ACL) and posterior cruciate (PCL) ligaments. The ACL runs diagonally in the middle of the knee, preventing the tibia from sliding out in front of the femur as well as providing rotational stability to the knee (Figure 1). The weight-bearing surface of the knee is covered by a layer of articular cartilage. On either side of the joint, between the cartilage surfaces of the femur and tibia, are the medial meniscus and lateral meniscus. The menisci act as shock absorbers and work with the cartilage to reduce the stresses between the tibia and the femur. It is estimated that 70 percent of ACL injuries occur through non-contact mechanisms while 30 percent result from direct contact with another player or object. The mechanism of injury is often associated with deceleration coupled with cutting, pivoting or sidestepping maneuvers, awkward landings or "out of control" play. Several studies have shown that female athletes have a higher incidence of ACL injury than male athletes in certain sports. It has been proposed that this is due to differences in physical conditioning, muscular strength, and neuromuscular control. Other hypothesized causes of this gender-related difference in ACL injury rates include pelvis and lower extremity (leg) alignment, increased ligamentous laxity and the effects of estrogen on ligament properties. Approximately 50 percent of ACL injuries occur in combination with damage to the meniscus, articular cartilage, or other ligaments. Additionally, patients may have bone bruises of the bone beneath the cartilage surface. These may be seen on an MRI and may indicate injury to the overlying articular cartilage. Immediately after the injury, patients usually experience pain and swelling and the knee feels unstable. Within a few hours after a new ACL injury, patients often have a large amount of knee swelling, a loss of full range of motion, pain or tenderness along the joint line and discomfort while walking. In addition to performing special tests for identifying meniscus tears and injury to other ligaments of the knee, the physician will often perform the Lachman's test to see if the ACL is intact. If the ACL is torn, the examiner will feel increased forward (upward or anterior) movement of the tibia in relation to the femur (especially when compared to the normal leg) and a soft, mushy endpoint (because the ACL is torn) when this movement ends. Here is a link to other Lachman's test movies. Another test for ACL injury is the pivot shift test. In this test, if the ACL is torn, the tibia will start forward when the knee is fully straight and then will shift back into the correct position in relation to the femur when the knee is bent past 30 degrees. The natural history of an ACL injury without surgical intervention varies from patient to patient and depends on the patient's activity level, degree of injury and instability symptoms. The prognosis for a partially torn ACL is often favorable, with the recovery and rehabilitation period usually spanning 2 to 3 months. However, some patients with partial ACL tears may still have instability symptoms. Close clinical follow-up and a complete course of physical therapy helps identify those patients with unstable knees due to partial ACL tears. Complete ACL ruptures have a much less favorable outcome. After a complete ACL tear, some patients are unable to participate in cutting or pivoting-type sports, while others have instability during even normal activities such as walking. There are some rare individuals who can participate in sports without any symptoms of instability. This variability is related to the severity of the original knee injury as well as the physical demands of the patient. About half of ACL injuries occur in combination with damage to the meniscus, articular cartilage or other ligaments. Secondary damage may occur in patients who have repeated episodes of instability due to ACL injury. With chronic instability, up to 90 percent of patients will have meniscus damage when reassessed 10 or more years after the initial injury. Similarly, the prevalence of articular cartilage lesions increases up to 70 percent in patients who have a 10-year-old ACL deficiency. Patients treated with surgical reconstruction of the ACL have long-term success rates of 82 percent to 95 percent. Recurrent instability and graft failure are seen in approximately 8 percent of patients. The goal of the ACL reconstruction surgery is to prevent instability and restore the function of the torn ligament, creating a stable knee. This allows the patient to return to sports. There are certain factors that the patient must consider when deciding for or against ACL surgery. Active patients involved in sports or jobs that require pivoting, turning or hard-cutting as well as heavy manual work are encouraged to consider surgical treatment. This includes older patients who have previously been excluded from consideration for ACL surgery. Activity, not age, should determine if surgical intervention should be considered. It is common to see ACL injuries combined with damage to the menisci (50 percent), articular cartilage (30 percent), collateral ligaments (30 percent), joint capsule, or a combination of the above. The "unhappy triad", frequently seen in football players and skiers, consists of injuries to the ACL, the MCL and the medial meniscus. In cases of combined injuries, surgical treatment may be warranted and generally produces better outcomes. As many as 50 percent of meniscus tears may be repairable and may heal better if the repair is done in combination with the ACL reconstruction. The quadriceps tendon autograft is often used for patients who have already failed ACL reconstruction. The middle third of the patient's quadriceps tendon and a bone plug from the upper end of the knee cap are used. This yields a larger graft for taller and heavier patients. Because there is a bone plug on one side only, the fixation is not as solid as for the patellar tendon graft. There is a high association with postoperative anterior knee pain and a low risk of patella fracture. Patients may find the incision is not cosmetically appealing. Allografts are grafts taken from cadavers (Figure 10) and are becoming increasingly popular. These grafts are also used for patients who have failed ACL reconstruction before and in surgery to repair or reconstruct more than one knee ligament. Advantages of using allograft tissue include elimination of pain caused by obtaining the graft from the patient, decreased surgery time and smaller incisions. The patellar tendon allograft allows for strong bony fixation in the tibial and femoral bone tunnels with screws. However, allografts are associated with a risk of viral transmission, including HIV and Hepatitis C, despite careful screening and processing. Several deaths linked to bacterial infection from allograft tissue (due to improper procurement and sterilization techniques) have led to improvements in allograft tissue testing and processing techniques. There have also been conflicting results in research studies as to whether allografts are slightly more susceptible to graft elongation (stretching), which may lead to increased laxity during testing. Before any surgical treatment, the patient is usually sent to physical therapy. Patients who have a stiff, swollen knee lacking full range of motion at the time of ACL surgery may have significant problems regaining their motion after surgery. It usually takes three or more weeks from the time of injury to achieve full range of motion. It is also recommended that some ligament injuries be braced and allowed to heal prior to ACL surgery. The patient, the surgeon and the anesthesiologist select the anesthesia used for surgery. Patients may benefit from an anesthetic block of the nerves of the leg to decrease postoperative pain. The surgery usually begins with an examination of the patient's knee while the patient is relaxed due the effects of anesthesia. This final examination is used to verify that the ACL is torn and also to check for looseness of other knee ligaments that may need to be repaired during surgery or addressed postoperatively. If the physical exam strongly suggests the ACL is torn, the selected tendon is harvested (for an autograft) or thawed (for an allograft) and the graft is prepared to the correct size for the patient. After the graft has been prepared, the surgeon places an arthroscope into the joint. Small (one-centimeter) incisions called portals are made in the front of the knee to insert the arthroscope and instruments and the surgeon examines the condition of the knee. Meniscus and cartilage injuries are trimmed or repaired and the torn ACL stump is then removed. In the most common ACL reconstruction technique, bone tunnels are drilled into the tibia and the femur to place the ACL graft in almost the same position as the torn ACL. A long needle is then passed through the tunnel of the tibia, up through the femoral tunnel, and then out through the skin of the thigh. The sutures of the graft are placed through the eye of the needle and the graft is pulled into position up through the tibial tunnel and then up into the femoral tunnel . The graft is held under tension as it is fixed in place using interference screws, spiked washers, posts or staples. The devices used to hold the graft in place are generally not removed. 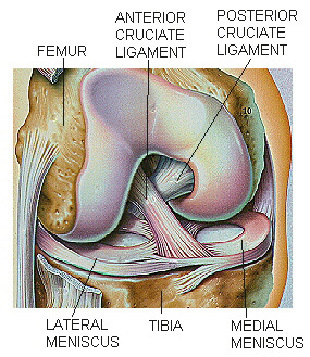 Variations on this surgical technique include the "two-incision" and "over-the-top" types of ACL reconstructions, which may be used because of the preference of the surgeon or special circumstances (revision ACL reconstruction, open growth plates). Before the surgery is complete, the surgeon will probe the graft to make sure it has good tension, verify that the knee has full range of motion and perform tests such as the Lachman's test to assess graft stability. The skin is closed and dressings (and perhaps a postoperative brace and cold therapy device, depending on surgeon preference) are applied. The patient will usually go home on the same day of the surgery. The incidence of infection after arthroscopic ACL reconstruction has a reported range of 0.2 percent to 0.48 percent. There have also been several reported deaths linked to bacterial infection from allograft tissue due to improper procurement and sterilization techniques. Allografts specifically are associated with risk of viral transmission, including HIV and Hepatitis C, despite careful screening and processing. The chance of obtaining a bone allograft from an HIV-infected donor is calculated to be less than 1 in a million. We do not use allografts at our hospital. Rare risks include bleeding from acute injury to the popliteal artery (overall incidence is 0.01 percent) and weakness or paralysis of the leg or foot. It is not uncommon to have numbness of the outer part of the upper leg next to the incision, which may be temporary or permanent. A blood clot in the veins of the calf or thigh is a potentially life-threatening complication. A blood clot may break off in the bloodstream and travel to the lungs, causing pulmonary embolism or to the brain, causing stroke. This risk of deep vein thrombosis is reported to be approximately 0.12 percent. Recurrent instability due to rupture or stretching of the reconstructed ligament or poor surgical technique (reported to be as low as 2.5 percent and as high as 10 percent) is possible. Knee stiffness or loss of motion has been reported at between 5 percent and 25 percent. Rupture of the patellar tendon (patellar tendon autograft) or patella fracture (patellar tendon or quadriceps tendon autografts) may occur due to weakening at the site of graft harvest. In young children or adolescents with ACL tears, early ACL reconstruction creates a possible risk of growth plate injury, leading to bone growth problems. The ACL surgery can be delayed until the child is closer to reaching skeletal maturity. Alternatively, the surgeon may be able to modify the technique of ACL reconstruction to decrease the risk of growth plate injury. Postoperative anterior knee pain is especially common after patellar tendon autograft ACL reconstruction. The incidence of pain behind the kneecap varies between 4 percent and 56 percent in studies, whereas the incidence of kneeling pain may be as high as 42 percent after patellar tendon autograft ACL reconstruction. Remain in bed with ACL-reconstructed leg elevated above heart. Maintain full extension on the ACL-reconstructed leg. Maintain at least 120° of flexion on the ACL-reconstructed leg. Maintain full flexion on the graft-donor leg. Use the shuttle to work on increasing strength on the graft-donor leg. Activity level will be determined by the condition of knees (activity increases as knee progresses). Regaining patellar tendon strength is the main focus of rehabilitation between weeks two to four. Ideally, the patient should perform high repetitions of strengthening exercises several times a day. Physical therapy will design an individual rehabilitation program according to the patient's objectives and goals. Activity level will be determined by the condition of knees. Ability to return to activities will depend on the full range of motion and lack of swelling in the ACL-reconstructed leg.